In stock -This product will ship today if ordered within the next 6 hours and 35 minutes. CLAs (Conjugated Linoleic Acids) are natural components of animal foods derived from linoleic acid. They are found in milk fat, dairy foods and meats derived from ruminant animals. 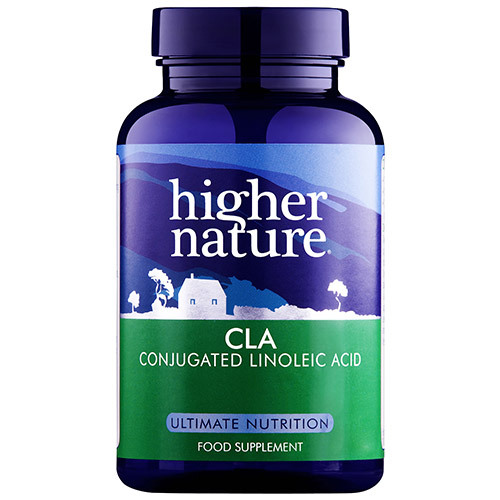 CLA, made from Safflower oil, may help maintain a healthy level of body fat and lean body mass for a more streamlined, fitter looking figure. Safflower oil providing octodecadenoic acid (minimum 80% as conjugated linoleic acid), capsule shell: gelatine, glycerine. Take 1 capsule with a meal up to 3 times a day, or as your health professional advises. Below are reviews of Higher Nature CLA - 90 x 1000mg Capsules by bodykind customers. If you have tried this product we'd love to hear what you think so please leave a review. 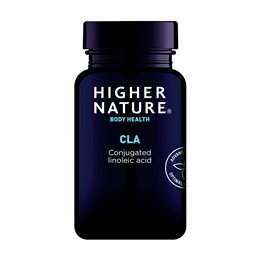 Question about Higher Nature CLA - 90 x 1000mg Capsules Is this meant to be taken instead of food or with food? CLA should be taken along with your meal. The recommended dosage is 1 capsule taken with a meal up to 3 times per day. CLA, made from Safflower oil may help maintain a healthy level of body fat and lean body mass for a more streamlined, fitter looking figure.